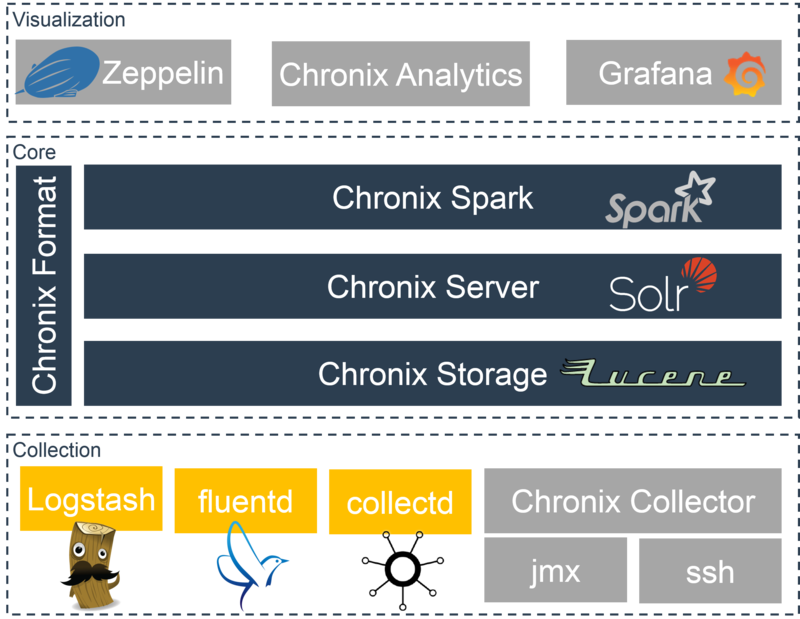 Chronix Storage: Use Chronix as a small storage library and plug it into your application. It stores the time series using Apache Lucene. Chronix Server: Combine Chronix with Apache Solr for a typical client-server scenario. Apache Solr offers several useful features like scalability, fault tolerance, distributed indexing, or replication. Chronix Spark: Whenever you need a parallel and distributed time series processing, integrate Chronix with Apache Spark. Leverage Apache Spark to process a time series in parallel. The whole Chronix Stack is open source and free to use for everyone without any restrictions. The stack has Chronix at its core but several other open source projects like logstash, collectd, fluentd, Grafana and Zeppelin are tightly integrated.